Set MSG Ringtone on Girlfriend Whatsapp MSG using this trik you can select an individual ringtone for each your whats app number. 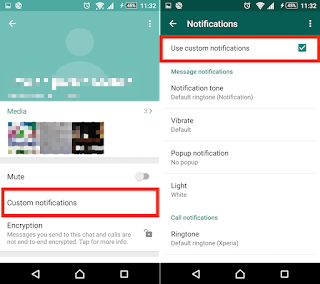 1) Open Whatsapp and Open the chat contact on which you want to set special msg ringtone. Custom Notification clicks on the custom notification. 3) Check right on use custom notification and select the msg Rington witch you want. and now you can not miss the single important msg. Previous articleHow you can Share on whatsapp these file type ZIP, PDF, EXE, APK, RAR and Big Files.